Welcome to our Website! This is where you can learn everything you ever wanted to know about our community and can keep up-to-date on current issues of concern. We ask residents to please register so that they can be added to our email list. Make a point of checking in often, and use the Feedback page to tell us how we can improve the site to better serve your needs. Click button to add this site to your list of favorites. 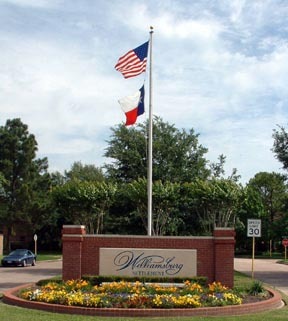 The Williamsburg Settlement Maintenance Association Board is firmly committed to maintaining the subdivision to preserve it as a first class community to foster and enhance a high standard of quality. We truly hope that each resident will take pride in his or her property to help maintain the Settlement at this level and become involved with this process of resident government. The help of all residents is needed for the betterment of our subdivision and maintenance of our high standards. Williamsburg Settlement is a prestigious place to live - let's keep it that way with the support of every individual. Amended minutes of MUD 62 February 8 Board Meeting.